The Army Materiel Command encompasses eight subordinate commands with 60,000 people at 285 locations in more than 40 states and 24 countries. And although the Army is 40 percent smaller than it was a few years ago, deployments are up 300 percent. To meet the challenge of deploying its dispersed work force, the command has turned to technology. One of the subordinate commands, the Tank-Automotive and Armaments Command, is leading the way with the adoption of enterprise asset management software. 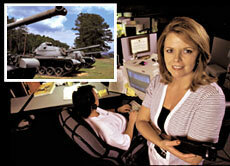 Beverly Brooks oversees the integrated customer service center at the Anniston Army Depot, which centralized systems to coordinate the maintenance of tanks and other vehicles. 'We processed nearly 700,000 requisitions last year and wrote more than 85,000 contracts,' said Maj. Gen. John S. Caldwell Jr., commander of the Tank-Automotive and Armaments Command. The result of those acquisitions is a massive amount of maintenance work for the tank command's Anniston Army Depot. The depot now centrally coordinates maintenance services through a single information technology shop. Nestled in the foothills of the Appalachian Mountains in northeast Alabama, the depot occupies more than 25 square miles of land that encompasses 18,000 acres of woodland. Soon after its establishment in 1942, Anniston became known within the Defense Department as the tank rebuilding center of the world. These days, however, the depot handles the maintenance of far more than tanks. It maintains and stores a host of battlefield gear, from land missiles and small arms to Humvees and tanks. And it houses 7 percent of the nation's chemical munitions stockpile. But with almost 3,000 employees working in 2,100 buildings under a tight systems budget, the depot's chiefs realized they had to restructure Anniston's systems use. Many of its IT management responsibilities were fragmented across multiple branch units. What's more, systems integration problems were common. The depot's network has 30 servers and 1,300 PCs running Microsoft Office and Exchange under either Unix or Microsoft Windows NT. A real hurdle was the help desk, which still handled most problems with paper trouble tickets. To keep up with computer problems, Anniston's help desk kept a fleet of vehicles constantly on rotation to respond to users' calls. To increase efficiency, the depot reorganized, placing network operations, help desk and telecommunications personnel in one centrally stationed unit. Anniston also began using Unicenter TNG, an asset management program from Computer Associates International Inc.
Brooks said Unicenter TNG has facilitated the integration of IT for every aspect of the depot's operations and established an infrastructure for the future use of other electronic-government applications. But getting to this step required the depot to revamp long-established ways of working. For instance, Brooks said, the webmaster formerly worked in a separate office from the help desk staff and system administrators. Now, they work closely together as a tight-knit, 15 person-strong team, she said. Depot users have a one-stop, customer service organization, Brooks said. Restructuring forced Anniston to scrutinize every process, leading to improvements in software delivery, equipment tracking and asset management, she said. As a result, the number of people that the IT team has working in the field has decreased by at least 40 percent. With field technicians replacing administrative staff at the help desk, the number of problems resolved during the first call by an end user has increased from almost zero to around 80 percent, Brooks said. In software delivery, the depot formerly had 10 technicians dedicated to installing and updating software at users' sites. Installing a new version of Office on all 1,300 client systems sometimes took as long as two months. Now, a single staff member can update Office on every desktop system in less than an hour, Brooks said. Anniston relies on Unicenter TNG's remote-control capabilities to diagnose and repair system glitches from the command center. Unless there is a hardware failure, the IT team no longer dispatches a technician to an end-user's location. The depot's IT team can manage the entire spectrum of Anniston's IT assets on an enterprise level. Next, it wants to bring the manufacturing systems'the machine tools, testing modules, power systems, and heating and air conditioning components'under centralized electronic management. The next step will likely be migration to an enterprise resource planning system; the goal is end-to-end control of all machinery on the base, Brooks said.